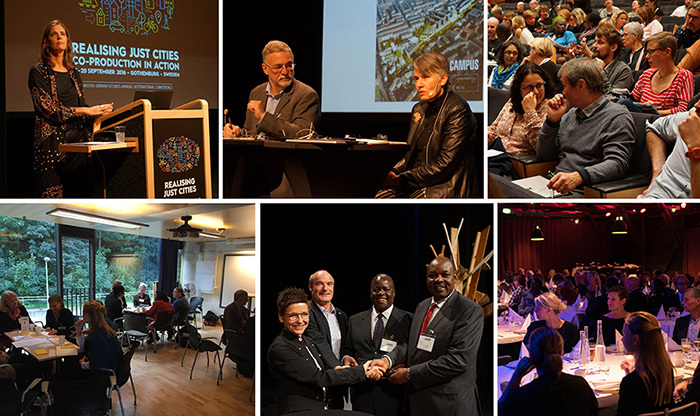 For two days, 19-20 September 2016, 200 participants from eleven countries gathered in Gothenburg to discuss how we can realise just cities through co-production at Mistra Urban Futures first annual conference, Realising Just Cities - Co-production in action. Dr Debra Roberts from eThekwini Municipality, Durban gave an inspiring talk about justice and equity and used the analogy that we have to manage and take care of the “urban motorcycle”. The concluding remark was that there is a need for a new social contract that breaks down barriers to power, knowledge and resources. Three sessions were held on Contextualising Just Cities, Why Co-production Matters and Learning from Co-production. Areas as that justice is nothing that will be organised by itself, the added value of co-production and its advantages in implementation and the role of intelligence in relation to ambition was discussed. The audience also watched the animation of a poem, Just Urban Research written by Professor Beth Perry, Director, Mistra Urban Futures, Sheffield-Manchester. So called re-thinking session on Mistra Urban Futures three core processes Urban Governance, Urban Knowledge and Urban Change was held. Political goals, civil society, the need for cultural change in organisations, the need for intelligence and not just information, the concept of a hive mind and that a city cannot be created for citizens, but by citizens was some of the topics discussed. On the 21st of September optional workshops were held on Mistra Urban Futures three core processes Urban Governance, Urban Knowledge and Urban Change and three TRACKS Socio-ecological Transformations, Socio-spatial Transformations and Socio-cultural Transformations. Co-production in Action: Towards realising just cities, edited by Henrietta Palmer, Deputy Scientific Director, Mistra Urban Futures and Helen Walasek, freelance editor, writer and researcher. Rethinking Sustainable Cities, edited by David Simon, Director, Mistra Urban Futures and published by Policy Press. Hållbar stad, "Det räcker inte med att leverera resultat för att förändra"
Mistra, Konferens om rättvisa städer – vad är det och hur går de att skapa? The #JustCities2016 was used throughout the conference and the discussion was active on Twitter, here is what was written.